Recognizing the purpose of being, the purpose of creation, one walks into the abyss of the heart. Recognizing the purpose of being and the creation of the soul, one shall begin to examine the ever-present reality of the eternal Creator within the matrix of creation. The matrix of creation lives within the Creator. Creator is the creation, and the creation is the Creator. 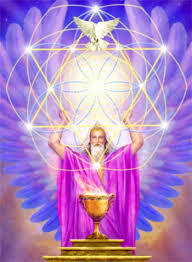 For one originates from the other, and the other originates from the one, through the torus field of creation. And so it goes, ever-expanding consciousness of being, ever-expanding creation of the Creator, ever-expanding Creator of the creation. For it is so, and so it is. The magnifying energies of the solar plexus, which shall be unleashing their effervescence of being, shall begin to be activated from the consonants of the highest octaves of being, from the consonants of the higher order of creation. The creation that hath, and shall, and does reside within the solar plexus shall begin to activate through the tones of ascension, the tones of the creation, the tones of oneness, and recognition of that which indeed you are; the tones of benevolence standing before you in all their might and glory. The tones of the creation and the tones of the creator are intermixing and interweaving into one wholesome whole, bringing forth the continuous cosmic energies of light, the continuous cosmic energies of love, abundance, and understanding thereof. The creation of that which you are shall spring anew, shall birth a new cognition of the cosmic energies flowing freely into your vehicles of choice, into your vehicles of ascension, flowing freely into the sacred space found within the solar plexus of your very being. Within the solar plexus is the channel to the energies of the Creator, whereby said energies shall allow the creation to become the Creator, awakening the secret knowledge of the ages, awakening the sacred wisdom with which you have all entered the earthly planes of GAIA. And as such, the awakening of said energies shall propel you further still through the ascension corridor, allowing you to play with your newly-found freedom of manifestation, allowing you to morph said energies into your chosen pathway of creation, allowing you to create, to manifest, the reality of the magnitude you wish to experience in accord with the sacred tones of ascension. What we are trying to say to you, dearly beloveds, is that upon your new moon, the entrance into the golden corridor of creation shall find you as children with play dough, organizing and morphing said play dough of energies, which you shall be radiating rapidly from your vehicle of ascension, into whichever route you will wish to launch such energies. This is allowing you to bypass the duality of your being, connecting you directly to the source of all that is, and allowing said energies to manifest the type of experience you wish to see in your daily activities. Those of you who have indeed emptied your vessels and made room for such an experience, no longer shall the creative energies be lying dormant therein. Those of you who have fully and truly let go of all that stood in your way to understanding the true potential of your being, the heavenly doors of your Creator-selves shall allow you to bathe in the effervescent energies of the golden particles of God, the golden particles of the Creator, the golden particles of the source. That is all that we have for you now, we love you, we are with you, good bye for now. Indigo star child all the way.